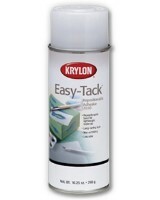 The Krylon Repositionable Adhesive temporarily and precisely holds lightweight materials, like stencils and photos, in place. This easy tack repositionable adhesive is non-wrinkling, low odor adhesive provides a repositionable bond on most lightweight materials. Allow your material to be adjusted, removed and reapplied throughout the life of the bond. Works well on wood, paper, metal, plastic, craft foam, glass, plaster, fabric, trims, glitter, photos and more. Extremely flammable. Contents under pressure. Conforms to ASTM D4236. Comes in 10.25 ounces aerosol can. Temporary positioning can be adjusted, removed and reapplied throughout the life of the bond. Test on Wood and Metal surfaces first.